Left: Skipper, Graeme Allen, with crew Brian and Margaret Nock, John Burns (centre co owner of Late a Gain). Right: Pix and Frank Mackie and Paul Smolenski (co owner). 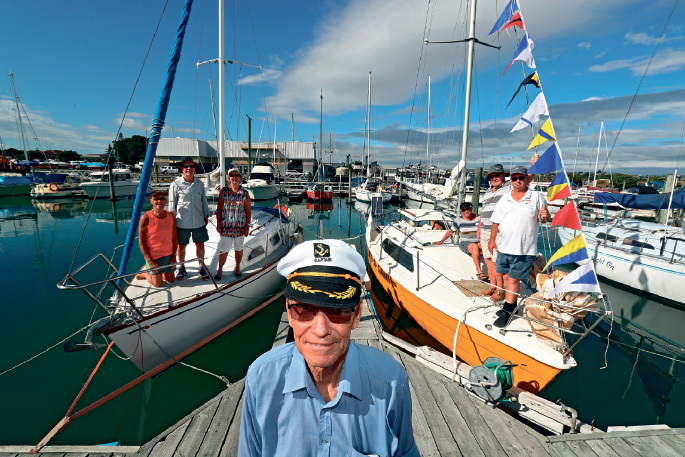 It is scarcely credible that more than 70 sailing enthusiasts could come together to celebrate the launch of a yacht 40 years ago, but it happened at the Omokoroa Yacht Club on Tuesday 12 February. A flotilla of seventeen yachts started from the line at Tauranga Yacht Club, followed by three launches carrying those for whom there was no space on a yacht, or who are less agile than they were in former years. There was an almost cloudless sky and a North West breeze provided a close hauled run along the channel to the finish at Omokoroa. The event was the brain child of John Burns the present joint owner of Late A Gain, a Farr 7.5 trailer yacht, with Paul Smolenski. John received generous help in planning and organizing from Lynne Whitaker and her team from the Tauranga Yacht & Power Boat Club over several months. Most of the people who came and brought their yachts and launches were ‘old salts’ from the Yacht Club who had at some time or other in the past owned a trailer yacht, or who had sailed in one with friends. Original owners of Late A Gain, Frank and Pix Mackie joined John Burns and his co-owner Paul Smolenski on the day too. The fleet was met at Omokoroa by dedicated volunteers from our hosts Omokoroa Yacht Club, who used their inflatable rescue boats to guide the bigger yachts to free moorings, and ferry crew and passengers to the beach. A festive atmosphere greeted the arrivals at the club, and old friends greeted each other with unrestrained pleasure. For many of us it was just great to be still alive, to shake hands and look in the eyes of once familiar faces. Omokoroa Yacht Club catering staff provided a sumptuous lunch fitting for the hot, hot, weather, that was consumed under every piece of available shade. For longest membership of the TYPBC - Garry Denniston, a member for 72 years. For still sailing their own self built yacht - Bevan Grant in ‘Clean Sheets’. For long time owner of the same yacht - Graeme Allen, 40 years. For longest distance travelled to be present on the day - Lee Jordan, from Thailand. Smallest trailer yacht participating - Geoff Collins in ‘Xena’ and Mike Lee in ‘Breeze Hunter’. Most recently purchased trailer yacht - Sascha Pearce in ‘Say Please’. Several members stood up to pay tribute to the trailer sailor fraternity and to thank John Burns and his team for a great day out on the water. Thanks were also expressed to the members of Omokoroa Yacht Club for their generous hospitality, along with the number of skippers who took time off work to host the veterans from past year. The “old salts” were very grateful to members of the Tauranga Yacht Club who took time away from work to bring out their Trailer Yachts. Those of us suffering the penalties of old age watched the fleet sail back with a following breeze from the elevated bridge of a launch, and rejoiced in memories of days spent on the high seas in our small trailer yachts.